Part One, season start through August 7, 2010. 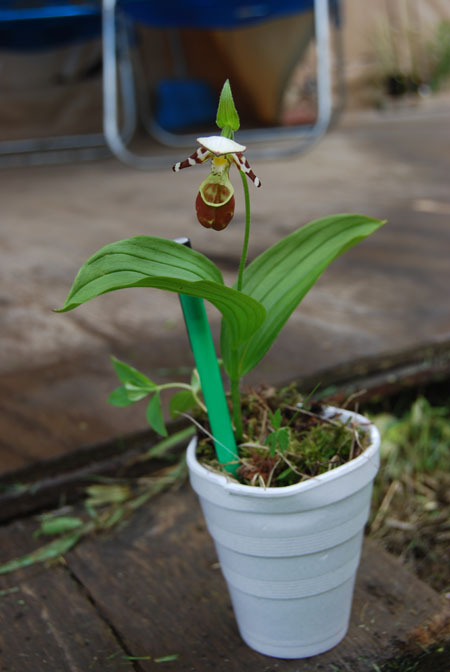 _ Part Two, August 7 to season end, 2010. The following is a who, when and where overview of the 2010 season. An asterisk (*) is placed after a person's name if they are a repeat visitor. The asterisk is red (*) if they are veterans of three or more trips with our organization. We are honored by the continued patronage of our guests and blessed with the continued help of our friends and staff. 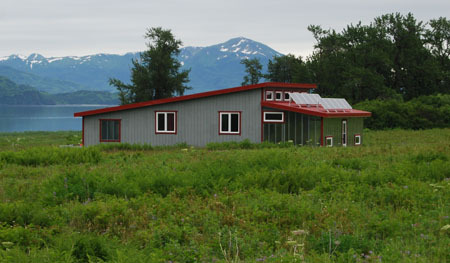 During the spring of 2010 some progress was made on AlpenViews new building. A 1000 watt solar package was installed to power up the building. 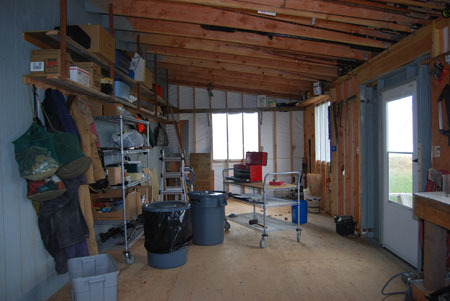 The new shop was wired and organized with shelving and work benches. After all the tools were moved into the new shop, the fish house was reorganized to make the fish packing area larger and more efficient. A shot of the new shop. 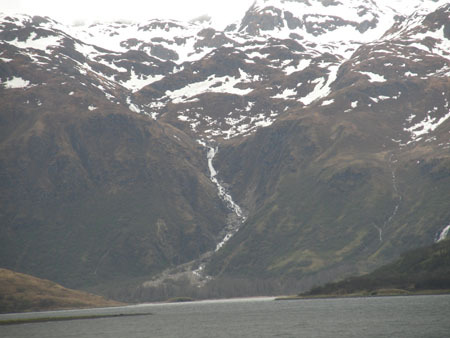 The waterfall looks cold in late May. Note the low elevation snow fields. A summer shot of AlpenViews new building. Note the solar panels on the sun rooms roof. 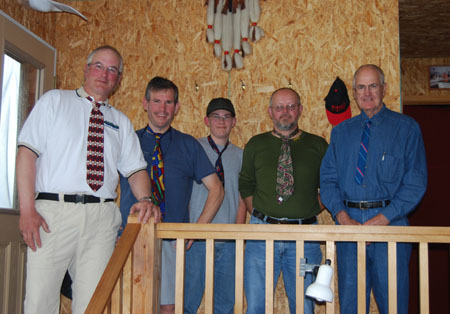 Left to right: Dave, Bouger, Maze, Darrell and Fred. 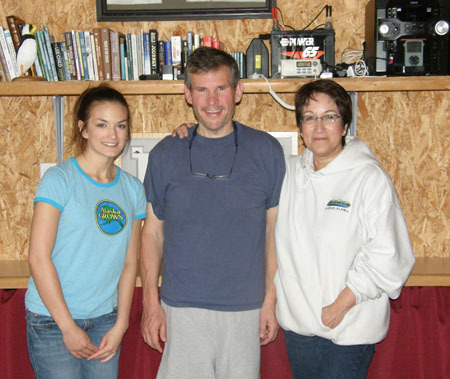 Staff for the week were Dave, Mickey and Molly Jones. 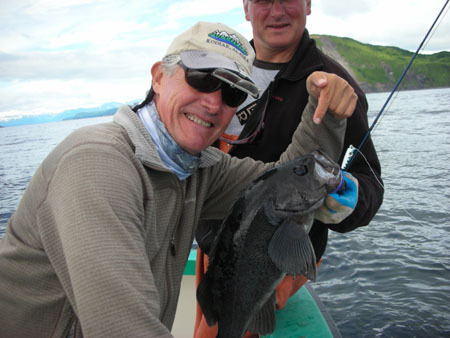 The name of the game in May and June at AlpenViews lodge is saltwater fishing. 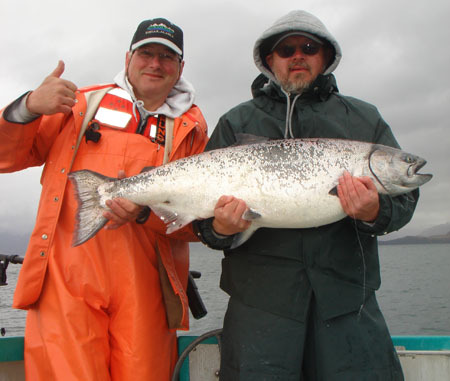 This time of year offers the best opportunity to catch big king salmon. Above: 13 year old Maze displays a monster king. 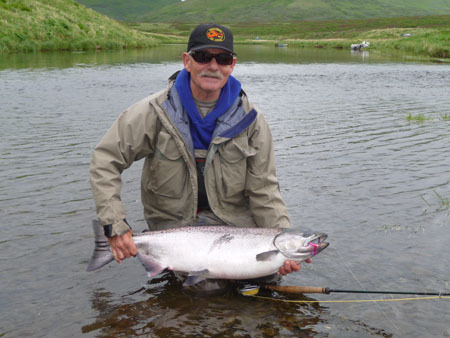 Above: Darrell displays a nice king. 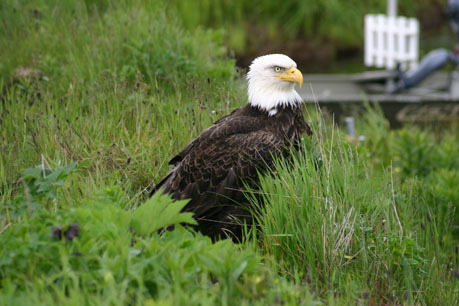 Just he filets of Darrell and Mazes kings weighed sixty pounds. 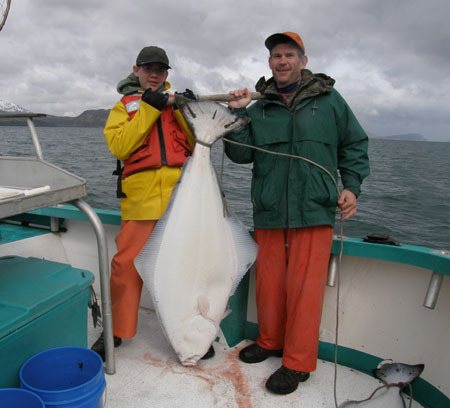 Maze and Bouger with one of their halibut. When fishing in the sea, the possibilities are almost endless. 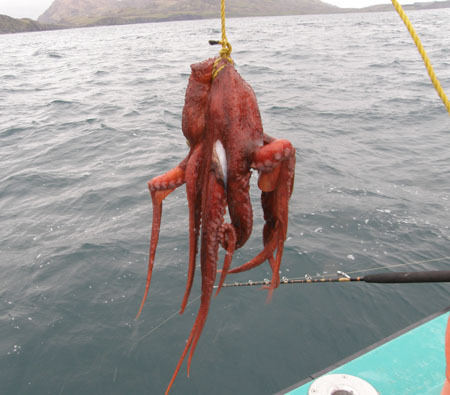 This octopus provided some exotic table fare and some great halibut bait. Lodge crew, Mickey and Dave. Lodge crew Moll and Mickey pose with Bouger. Left to right: Ole, Pat, Donny, Dave, Molly and Fritz. Staff for the week were Dave Jones, Molly Jones and Shawn Finn. 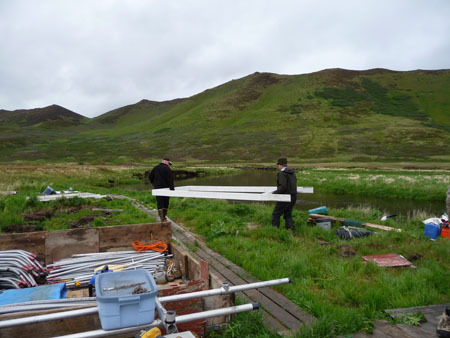 One of the first chores is to place and level the foundation frames for the tents. Ready? On three we lift. The tent floors are carried from the material pile, placed on the foundations and secured. Next order of business is to construct the steel frames. Shawn always makes sure we dont get to thirsty during the work day. Man has returned to the river. 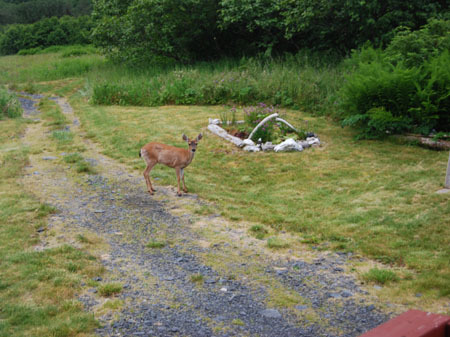 Some of the local animals look on with concern as we alter their environment. 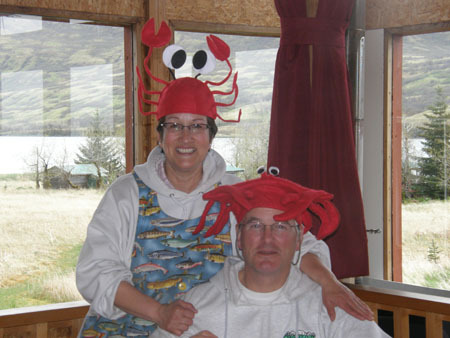 Its hard to keep the crew working when there are sockeye and king salmon to be caught. 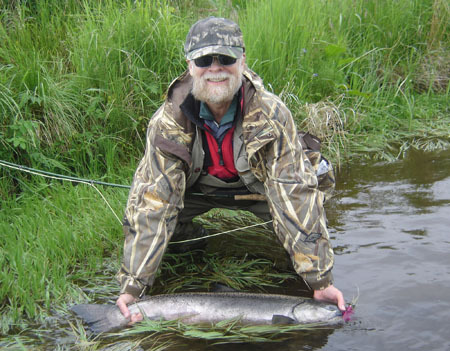 Below: Pat with a sockeye. Molly fights a king in the home pool. 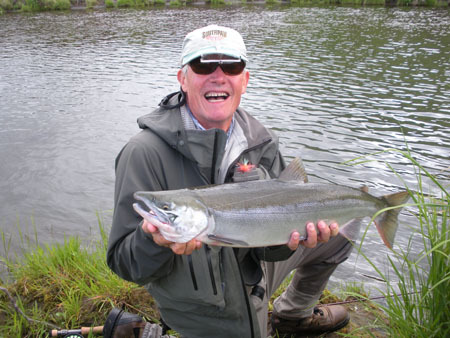 Spey rods are a great tool for king salmon fly fishing. 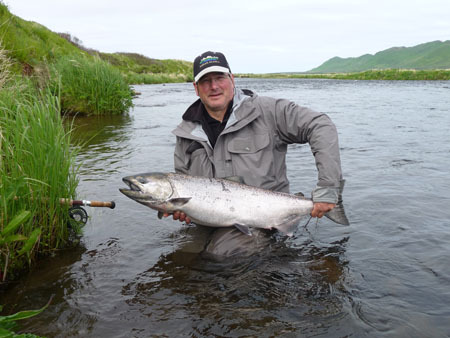 Ole landed this nice king on the fly. 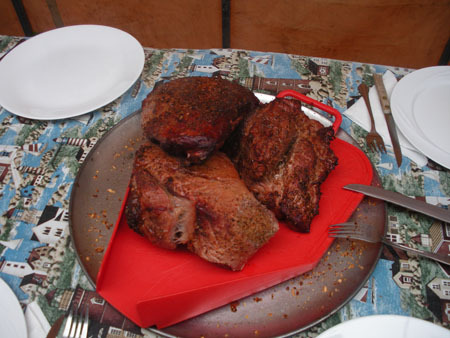 Dinner is a combination of smoker beef and venison. The fish hunter 360 arrives at the Swallow Hole. 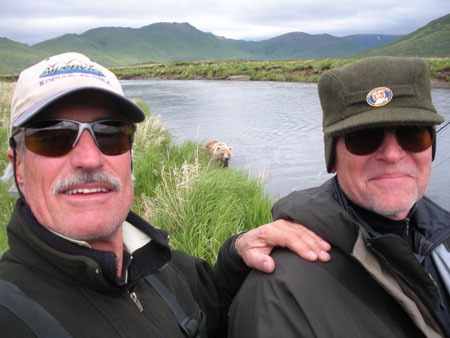 Right: Donny and fritz snap a self portrait of themselves and a bear. 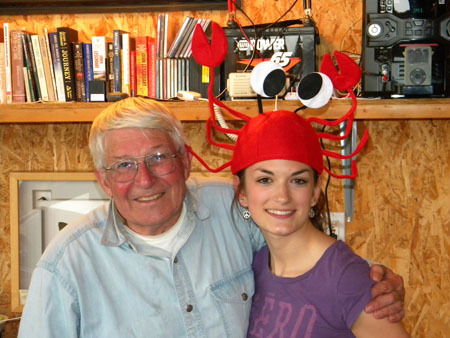 Below: Dave gets in on the king fishing action. 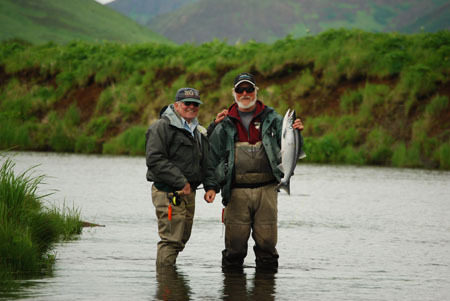 Right: Tim with a nice fly caught king. Standing, back row: Missy, Warren and Shawn. Standing, front row: Molly, Catherine, Hannah, Warren Jr. and Brett. Staff for the trip were Dave Jones, Molly Jones and Shawn Finn. Learning about fly fishing was a big part of this trip. Above: Dave instructs Hannah in making two handed roll casts while the rest of the class looks on from the bank. The two handed roll casts proved to be easy to learn. All the students were soon hooked up and fighting sockeye. Fly tying was also taught. 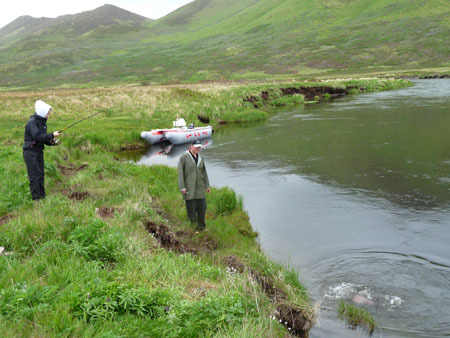 The flies produced were later used to great success in the fishery. Left: The banya was very popular with the younger crowd. 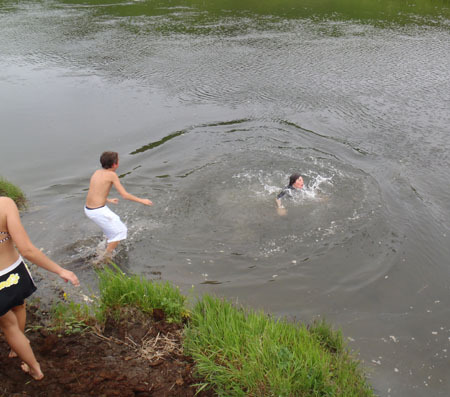 They seemed to spend as much time swimming in the river as they did in the banya (steam bath). 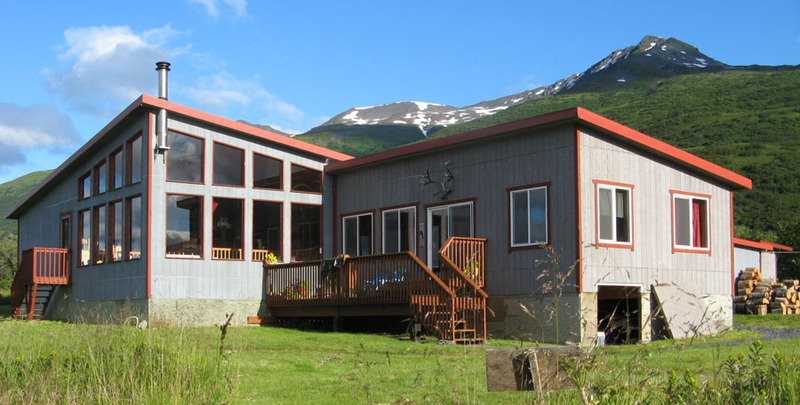 Above: Children must be accompanied by an adult while in the banya so Missy had her work cut out for her on this trip. It was nice to sit on the deck and enjoy an adult beverage after riding heard on four kids in the banya. The fishing lessons really paid off. Above: Some of the sockeye caught during the trip. 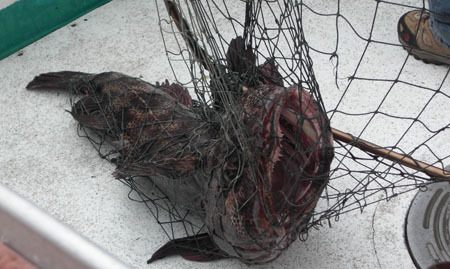 Below: Some of the kings caught during the trip. 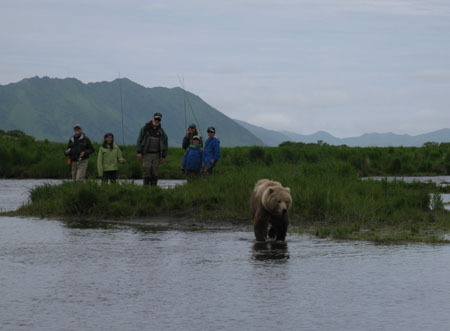 Bear viewing is always a part of fishing the Ayakulik. 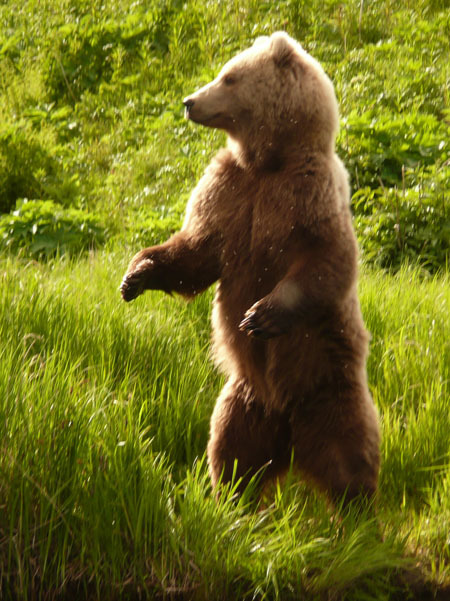 Above: Shawn stands watch as the group enjoys a bear encounter. A visit from family and friends. 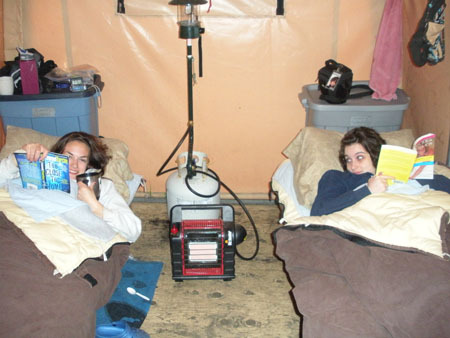 In camp for this trip were Merle Brown, Molly Jones, Amy Finn and Shawn Finn. 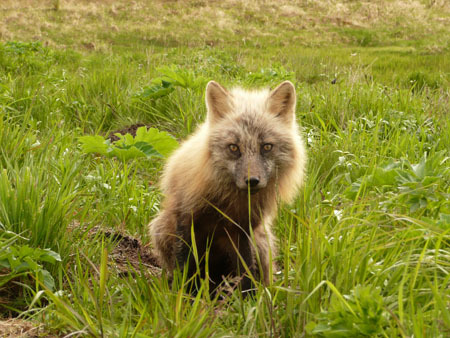 All from Kodiak, AK. 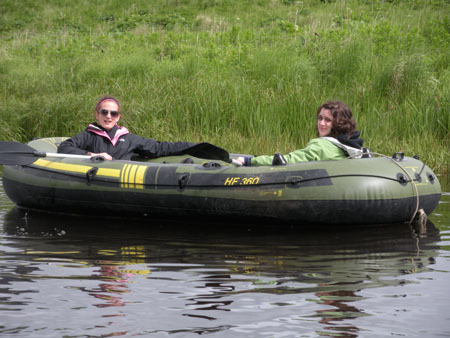 Above: Molly and Amy take a raft trip. 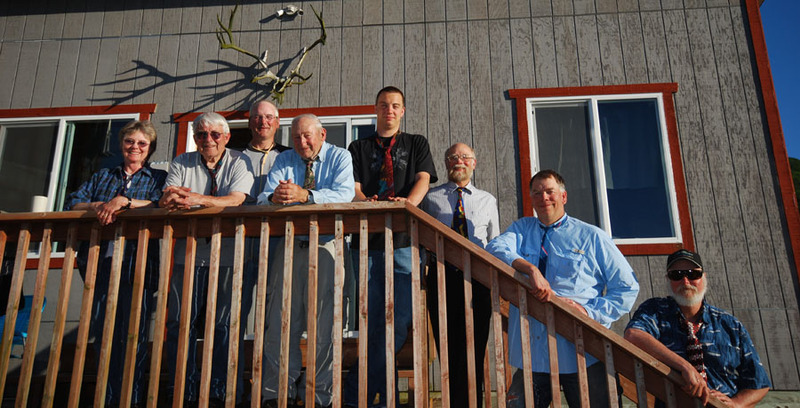 Left to right: Mary, Frank, Dave, Lloyd, David, Bruce, Scott and Shawn. 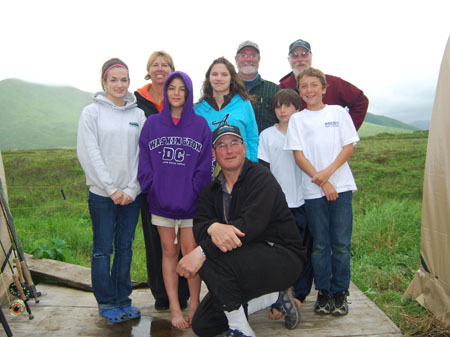 Staff for the week were Dave Jones, Molly Jones, Mickey Jones and Shawn Finn. "Sockeye Frank" and Shawn display a nice sockeye. 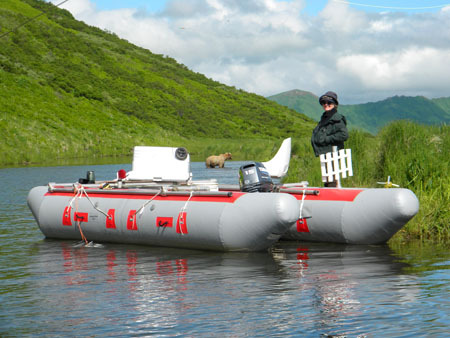 Mary stands guard over the boat in bear country. 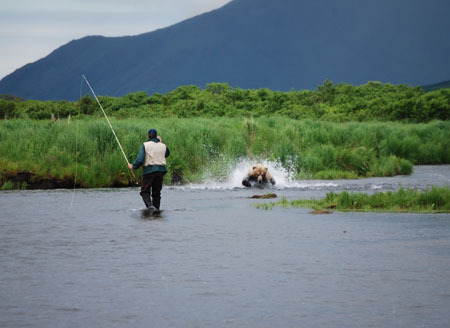 Scott watches as a bear charges fish in Red Lake Creek. This could have been a tense situation. 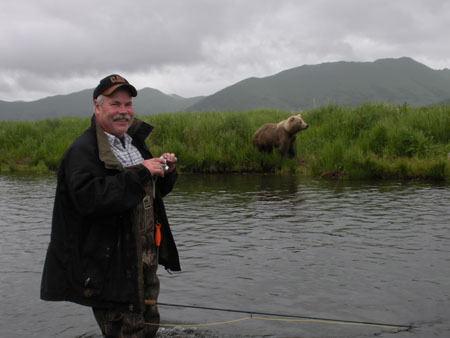 Scott, realizing the bear was fishing and not interested in him, just backpedaled slowly. It worked out fine in the end. 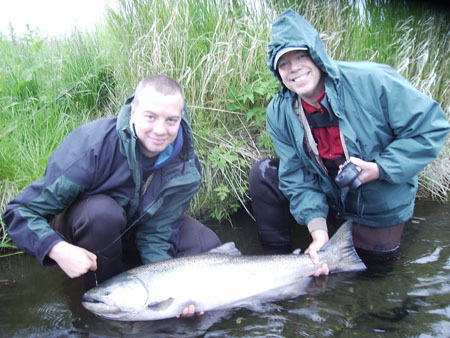 David and Scott with a nice king. 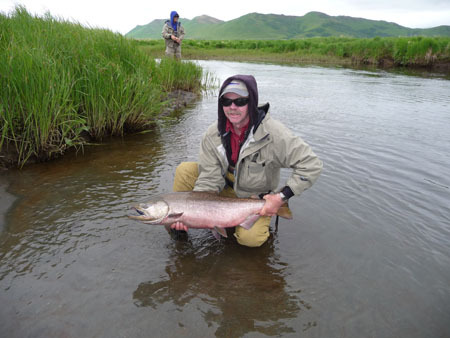 Bruce stood by his fly rod and was rewarded with this nice king. Above: Frank and Molly in the lodge. 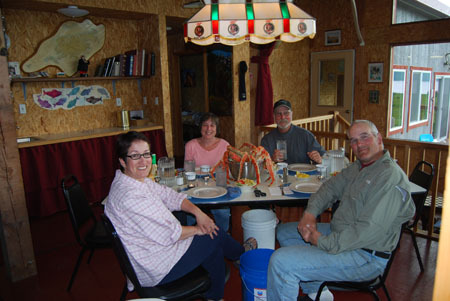 Tonights dinner is fresh crab. 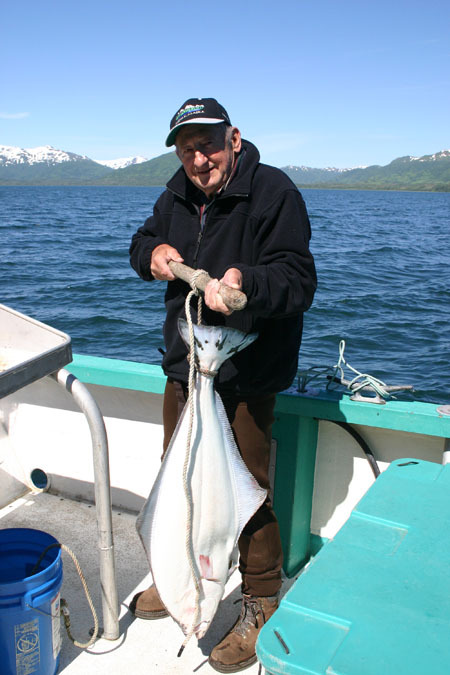 Right: Lloyd with a nice halibut on the Finlander. 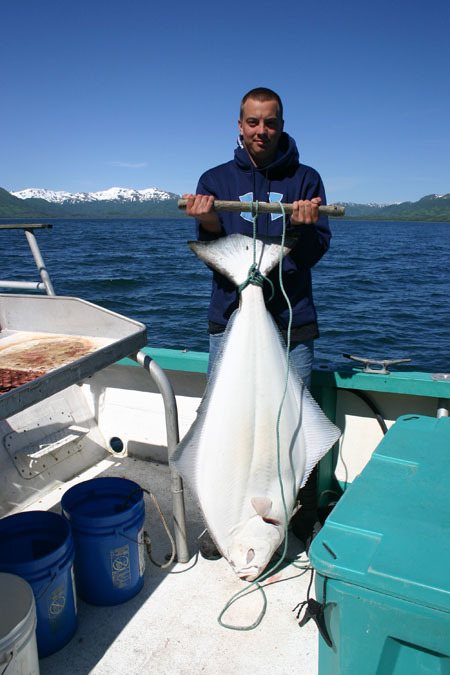 David and a big halibut. 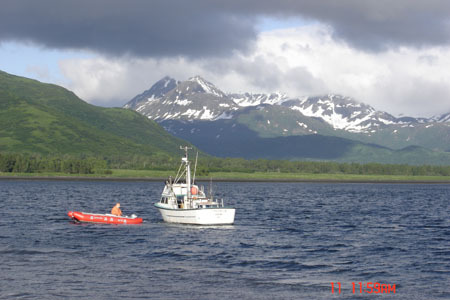 Below: The Finlander on her mooring in Ugak Bay. 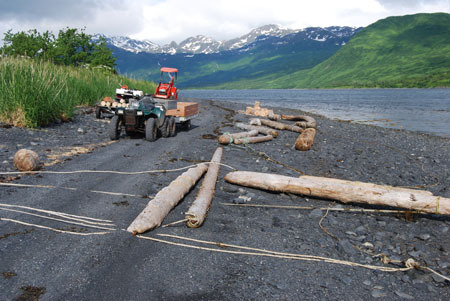 Logs are collected along the beaches of Ugak Bay and towed to AlpenView. The high tide sets them up on the beach where their cut into rounds. 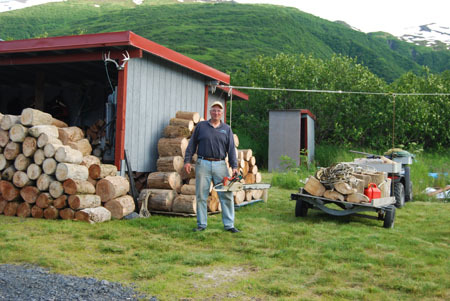 The rounds are stacked near the wood shed. You know that firewood, it dont just grow on trees. 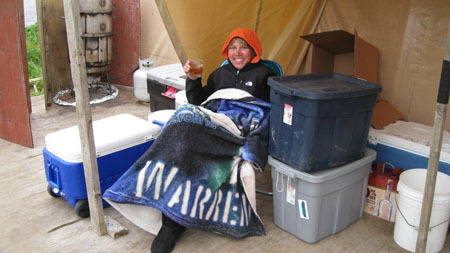 Between groups of clients, the staff, friends and family gather to work on lodge maintenance. We also take some time to relax and enjoy each others company. Above: An impromptu shareholders meeting. 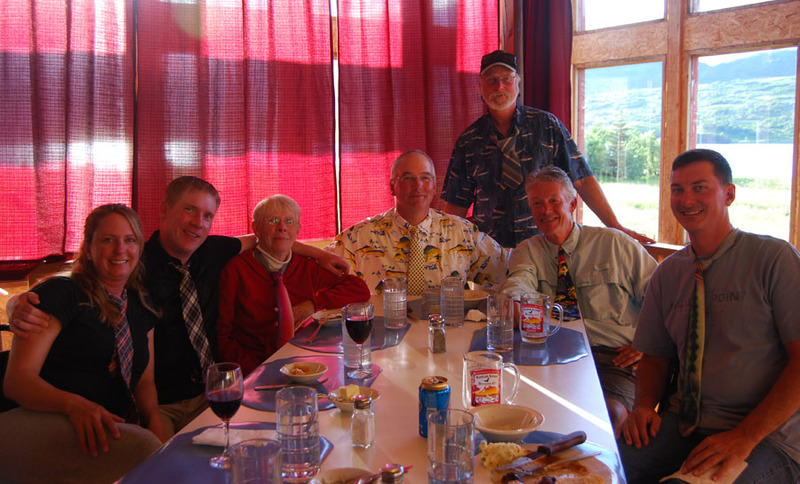 100% of all AlpenView Wilderness Lodge, Inc. stock is represented at the table. Below: Molly Jones and Pat Metrokin stand a wheel watch on the Finlander. 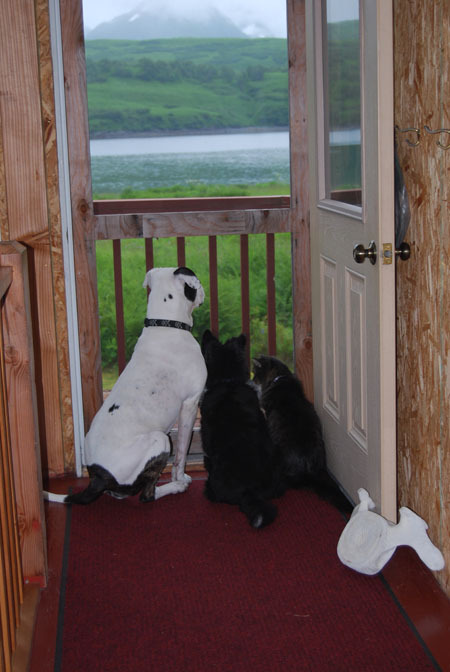 The Jones family pets watch faithfully for their masters to return from the sea. 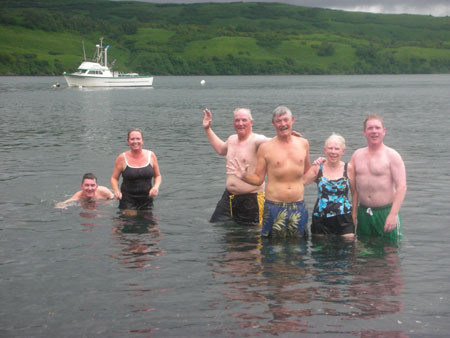 Left to right: Michelle, Marty, Joyce, Dave, Shawn, Pat and Chris. 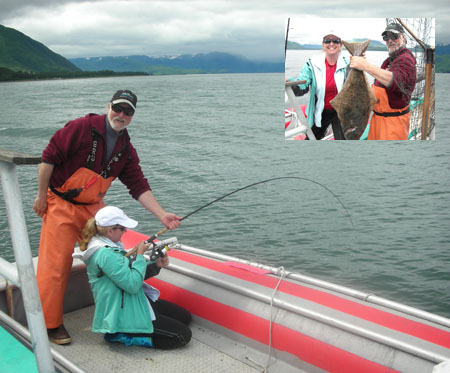 Left: Shawn helps Michelle to land a halibut. 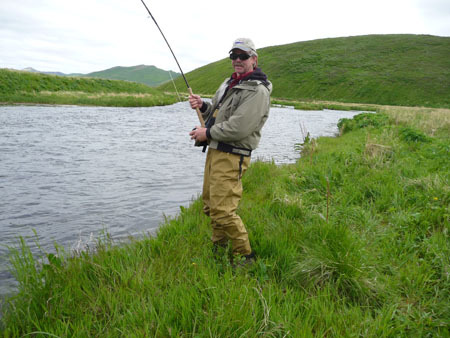 Above: Pat enjoys saltwater fly fishing. 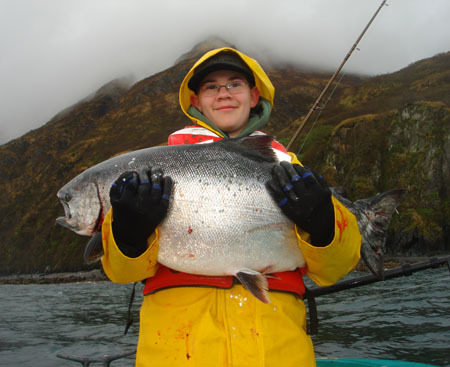 In this shot he displays a rock fish caught on a surface popper. It was a hoot! 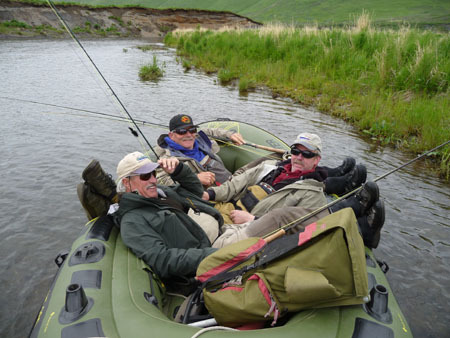 Below: The group had 100% participation in the Ugak Bay Club. No Banya weenies in this outfit. To quote the Rolling Stones "You cant always get what you want." 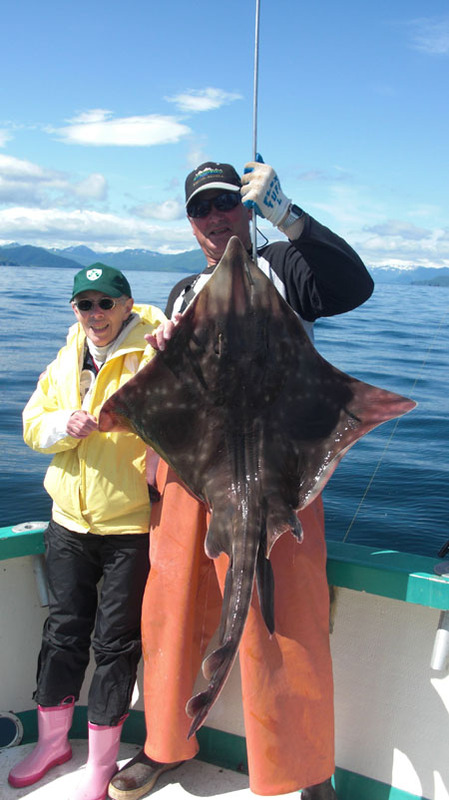 Joyce had fun catching this skate even though it was not the halibut she was looking for. What ever you do, dont let that thing out of that net! 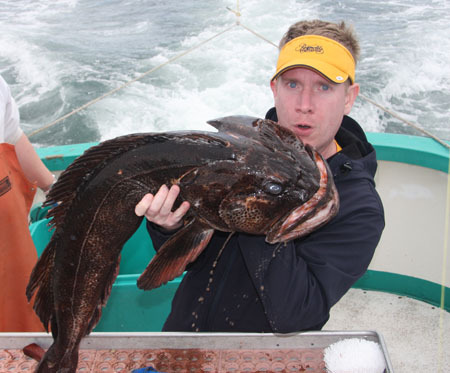 Right: Marty braves the teeth to display a lingcod. 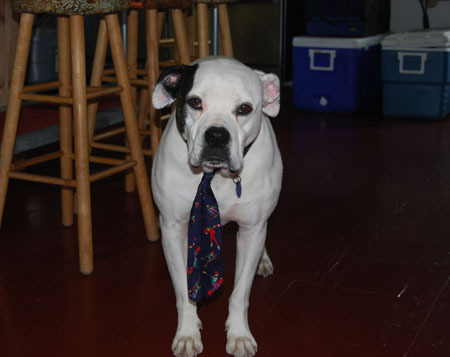 At your high class fishing lodges, even the dogs wear a tie. 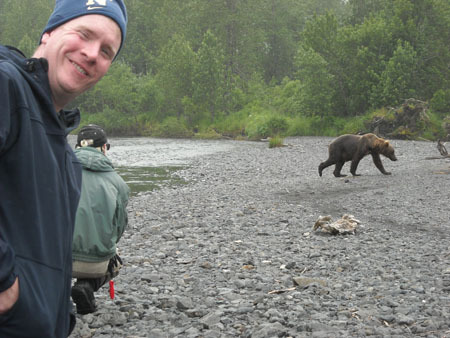 Marty and Shawn enjoy a bear encounter. 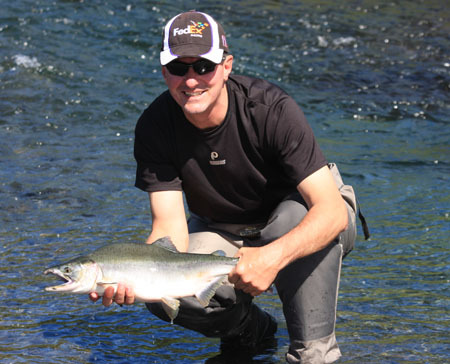 Freshwater fly fishing for pink salmon was productive. Chris caught this one. 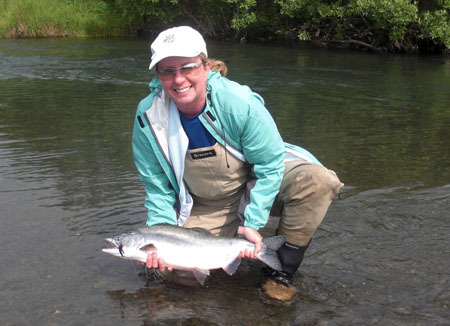 Michelle caught this pink salmon. 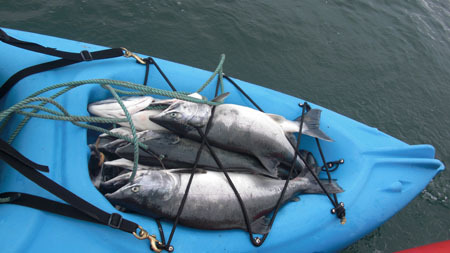 The kayak is used as a fish tender, transporting the catch to the processor. 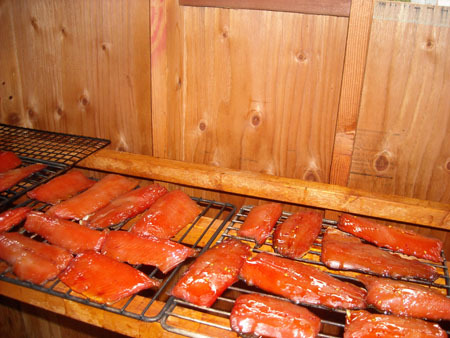 Some of the catch is cured in the lodge smoke house. 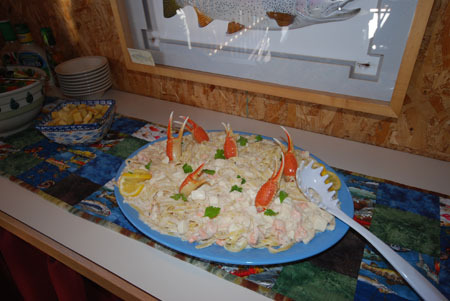 Part Two, August 7 to season end, 2010.